When it comes down to my style of photography, I believe Denmark and myself are a match made in heaven. The Silence, serenity and simple landscapes are just perfect for me to photograph. So much so, I was very excited to have the opportunity to go back to Denmark once again. Even more encouraging was the fact that I had been given the chance to visit a region I had not been to before. Those locations were the islands of MÃ¸n, Lolland and Falster. I visited during the springtime in May. Spring is one of my favourite seasons. I love seeing the trees starting to blossom, the sound of birdsong and the well-known yellow rapeseed fields start to emerge amongst the rolling hills. To me, all these incredible ingredients are very inviting and something that I relish when looking for and creating photographical opportunities. Trees rise above the yellow rapeseed fields. After arriving at Copenhagen Airport, I drove down along the South East coast of Zealand, making my way slowly down to the islands. But... not until I stopped to see the amazing UNESCO World heritage of Stevns Klint. The almost 20 kilometre long and 41 metres high cliffs, give you an unrestricted view over the Ã˜resund, and on clear days to Sweden and the Ã˜resund bridge, which make it perfect for hiking or a day out. On the island of MÃ¸n, I would stay for several nights in Ulvshale (which literally means 'Wolf's Tail'), which lies next to the stunning natural Nyord Enge Naturreservat on the tiny island of Nyord. My accommodation was the perfect starting point to explore my surroundings and the islands of Falster and Lolland. Looking over the meadows of Nyord Enge Naturreservat, on the small and cosy island of Nyord in eastern Denmark. The village of Stege is located on MÃ¸n, near the stunning and dramatic White Cliffs of MÃ¸ns Klint. Before visiting, I had seen a wide range of photography and read a lot about these cliffs. As a result, I was excited to have the opportunity to visit and see them for myself. It was as expected, an amazing location and natural wonder. Something I would thoroughly would recommend anyone visiting this particular area of Denmark, read all about MÃ¸ns Klint and my personal experiences within my blogpost here. My overnight stay was near the inviting and picturesque village of Stege. From there, I drove onwards to the islands Lolland and Falster, to explore many of the great highlights these regions have to offer. Stege is a lively old town with many nice boutiques, ice cream shops and some of the best restaurants, like Slagter Stig. A butcher who prepares the meat on the spot. You can enjoy their amazing cuisine, with even Zebra and Crocodile meat on the menu. Dining here was a very special and fantastic experience. As night falls, the sky in the harbour starts showing it's many colors. The pitoresque village of Stege in the evening lights. 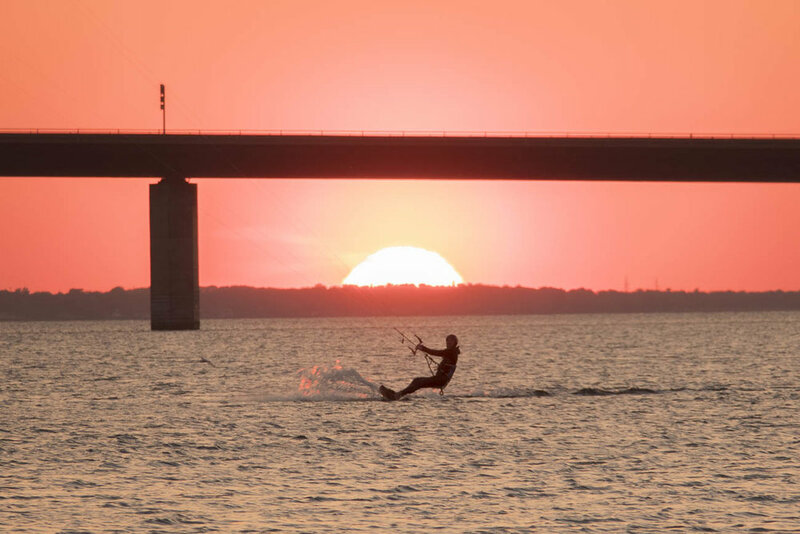 If you travel from MÃ¸n island to Falster, you will cross the small island of BogÃ¸, and pass a very popular Windsurfing and Kitesurfing spot, right next to the FarÃ¸ bridge. Here, surfers are urged only to surf north of FarÃ¸ in June, July and August out of respect for the birds on the nomination basis of the â€�EU bird protection areaâ€�. Spending a few hours of my day there was pretty inspiring. As the surfers were showing off their repertoire of many tricks, I found many opportunities to capture the perfect subject for my photographs. I really enjoyed driving through the beautiful Danish countryside, and sought every opportunity to travel along many of the smaller / quieter roads, this area has to offer. I also find once you come off the main roads, you always begin to find the best spots and unique photo opportunities as they lead you through the most amazing agricultural landscapes. With rolling hills, farmland and small woodland coppices, dotted all around. On both islands, you will find many little churches and stunning manor houses, such like here on Falster, where you will find the manor house of Corselitze and its beautiful English inspired garden. In 1777, the neoclassical main building was complete along with its newly landscaped English inspired garden, where I found this nice little shed. Along the way, I came across the most stunning sceneries, sceneries that I really like and landscapes that are very suited to my style of photography. Therefore, I continually found myself stopping the car frequently, in order to capture those spontaneous photography moments. Those little roads... I loved it and it was a great way to explore this elongated island. 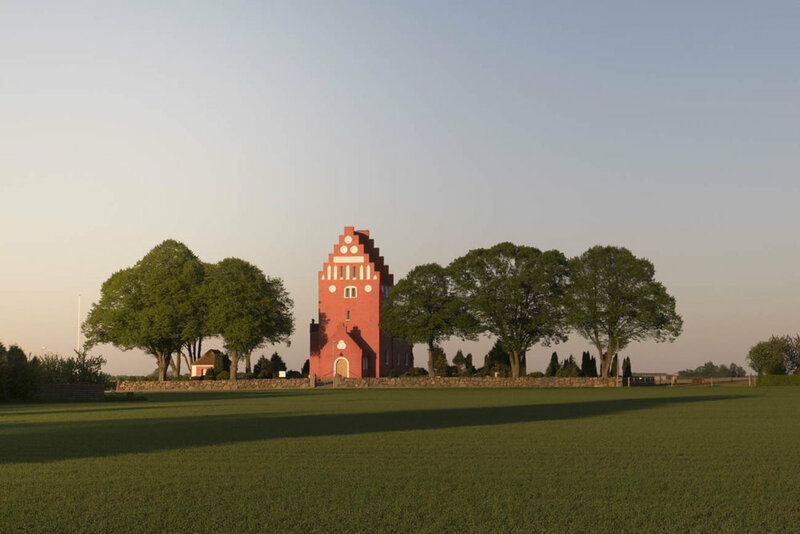 The little church of Falkerslev, one of Falsterâ€™s red-painted churches with white covers. Both islands have a wide variety of different beaches. One beach I would definitely recommend for you to go and visit, is the stunning white sandy beach of Marielyst on Falster, which turned out to be one of my favourites. It is part of the approximately 20 kilometres of sandy beach to be found on the east coast of Falster. It is a wide expanse of sand and is beautifully quiet. Once here you will find it to be great and it feels like you are lucky enough to almost have your own private beach. The beach has been chosen as 'Beach of the Year' in 2011, 2012 and 2013. One thing I have frequently noticed on my previous visits to Denmark, is just how good life is here. It always seems so inviting and life here generally feels very simple and relaxed. Everywhere you look, the surroundings are clean, organised and convenient. It must be the Scandinavian lifestyle. Something I really love! 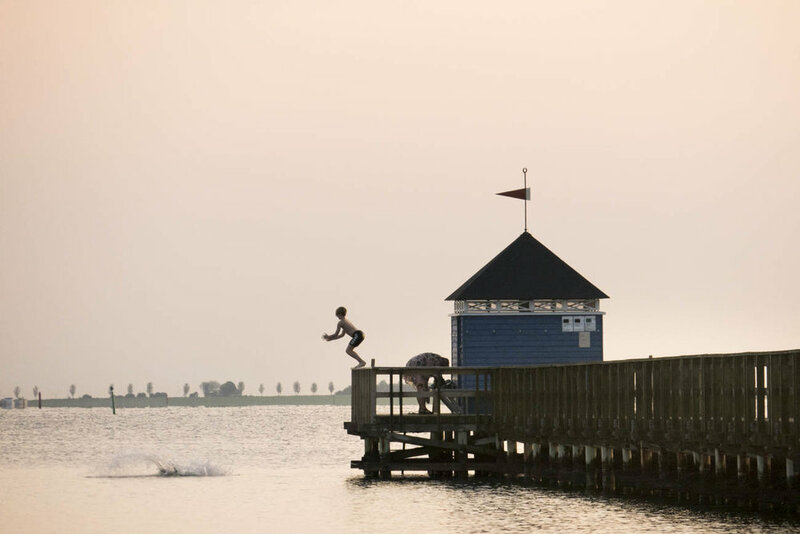 In Lolland, they have created a perfect recreational beach with a long jetty to enjoy swimming and sunbathing on. The nearby restaurant provides great food, from where you have some of the best views and amazing sunsets. A true recommendation for anyone who enjoys those beautiful sunset evenings! Those nice warm evening with friends..
A perfect spot for photographers! Another place in Nakskov in Lolland that is really worth visiting, is Albuen. The narrow spit out to Albuen is a special nature reserve. 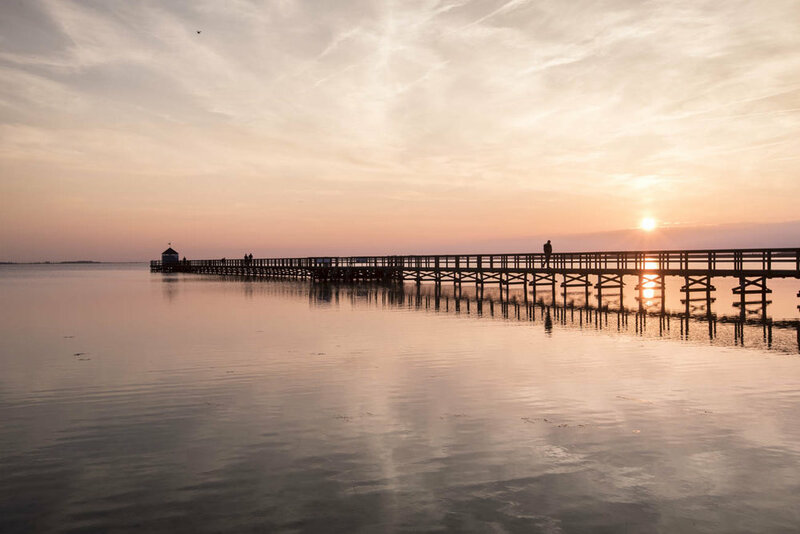 At the narrowest point the spit is only 25 metres wide, where on the inner side the fjord's calm water in SÃ¸ndernor can be experienced, while waves from LangelandsbÃ¦ltet break on the outer side. Just walking along the narrow path, you are able to see a variety of many special birds. If you like silence, simplicity and nature like I do, Denmark is your perfect destination to visit and stay. With its many highlights and attractions to experience. Zealand, MÃ¸n, Lolland and Falster in my opinion, are simply great islands to explore. I hope one day to return here once again, since I find the ever changing landscapes fascinating to photograph and there are many more locations yet to still experience. I would like to extend a very special thank you to the tourist boards of South Zealand - MÃ¸n and Lolland - Falster, for providing me with some wonderful and invaluable tips and also for allowing me to establish some remarkable memories. For more information about Denmark in general, please go to VisitDenmark.